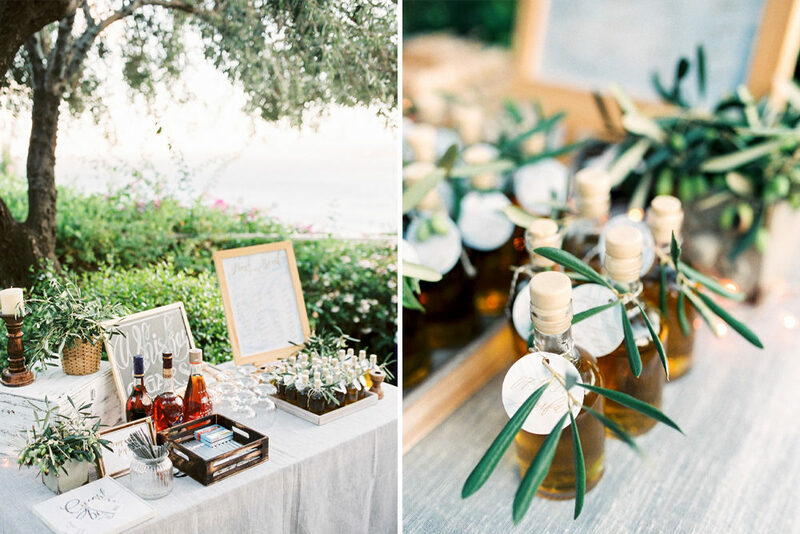 If you’re in desperate need of sun, sea and sand, then this dreamy destination wedding in Corfu is for you. 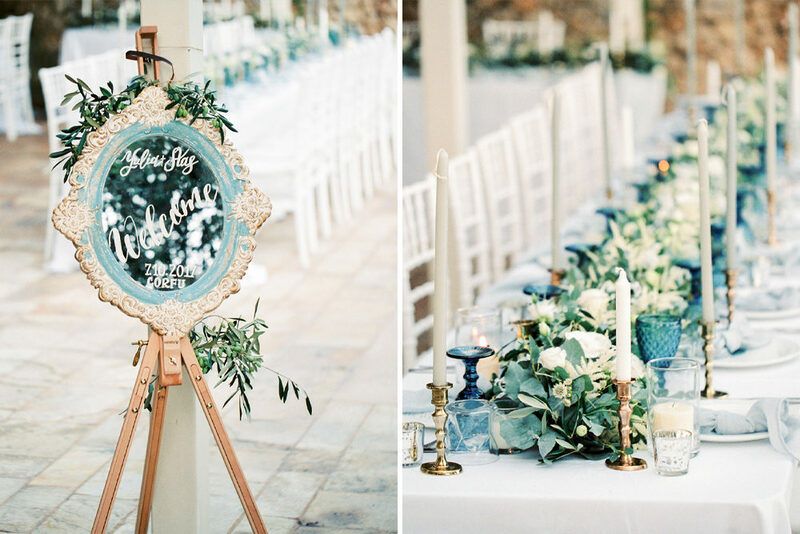 Taking inspiration from the county’s natural colour scheme, Julia & Stas opted for crisp white, pastel blues and green foliage to decorate their wedding in Greece. 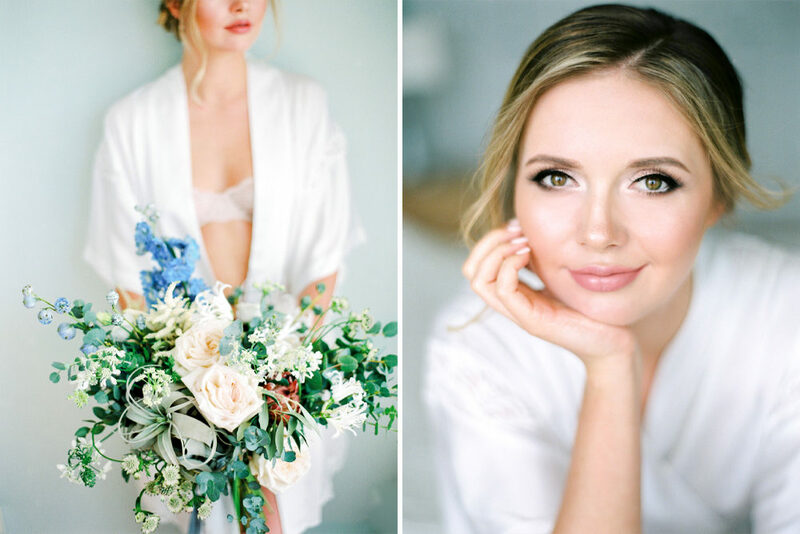 Julia even chose a powder blue Hayley Paige bridal gown which was utter perfection with is layers of tulle and spaghetti strap lace bodice. The lovely Rosmarin Wedding and Events executed the whole day beautifully. The tablescape with taper candles, geode name place settings, coloured goblets and floral garlands are PIN-tastic! As is the floral arch for the outdoor ceremony altar. And as for those golden beach couple portraits by Mikhail Balygin – wow! Literally jaw dropping-ly beautiful. Enjoy. Julia the Bride: We knew that we didn’t want a wedding for one evening only and then everybody leave. Because our relatives and friends live in different countries of the world our idea was to organise a vacation or, at least, a long weekend for our guests, that they could relax and enjoy the evening. The most difficult was to find a place where you can accommodate a large number of people and stay there for a few days. We started a search in Boston, where we live, but hotels or complexes that we liked were booked for 2 years in advance! Then we decided to start looking in Europe. 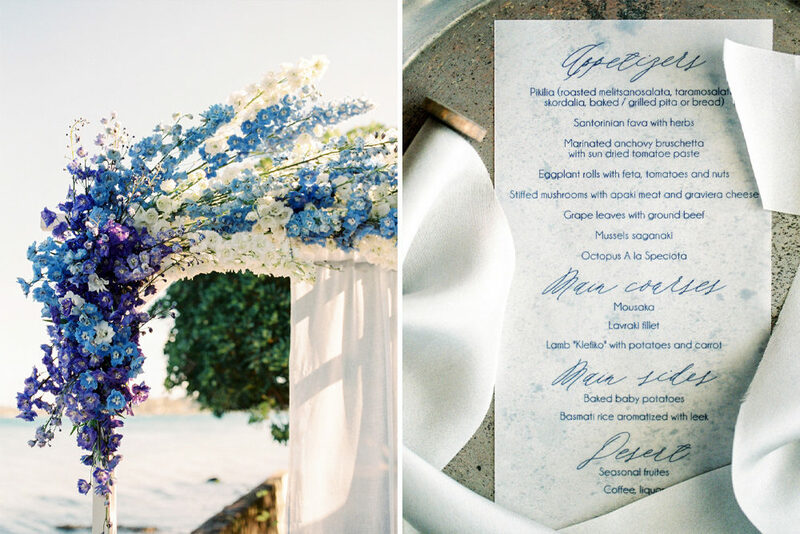 We always dreamed of going to Greece and decided why not combine our dream trip with the wedding! And we chose Corfu – big green island in the North of Greece. 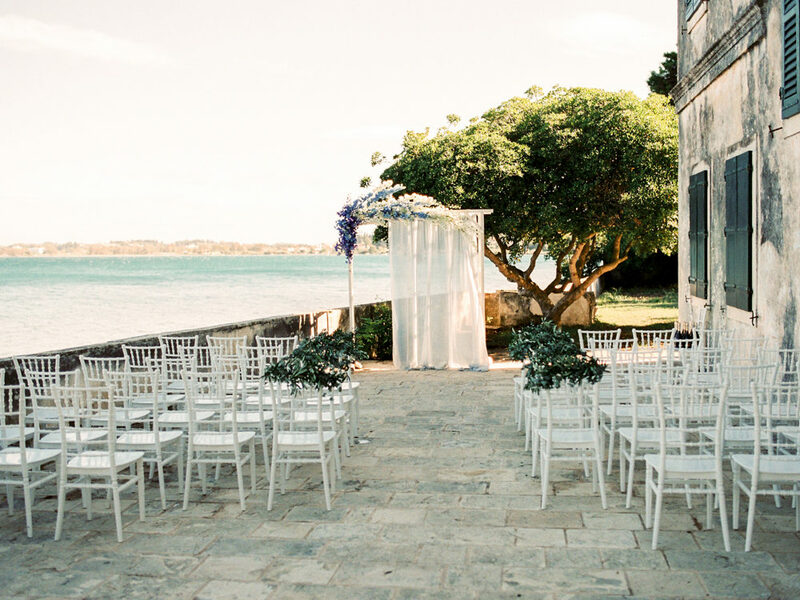 Since the wedding was in another country, we started looking for a wedding planner. I don’t know how we could organise such an event without our wonderful Anna from Rosmarin Wedding. The colour palette was easy to pick, we chose the organic colours for Greece: olive and dusty blue with various tones of these colours. My dream wedding dress from Hayley Paige was in light blue grey colour as well. 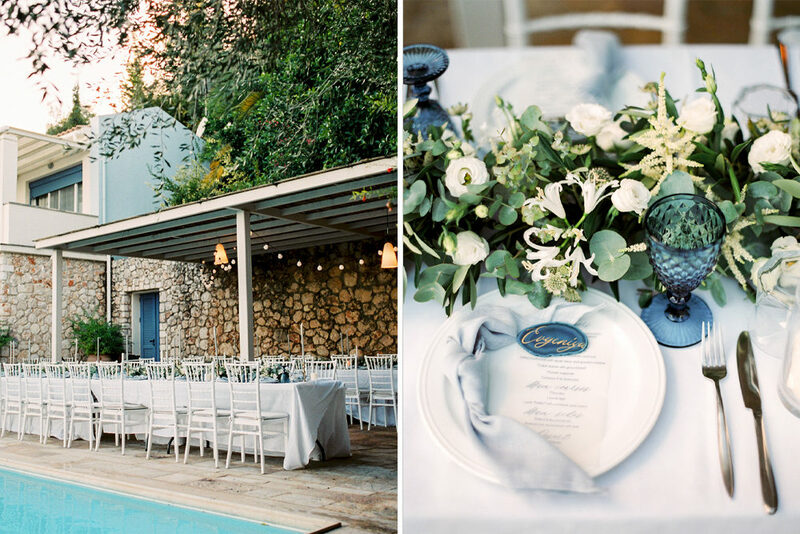 Since our weddings took place on the terrace of the private villa overlooking the sea, apart from flowers, the decor was simply not needed. Since we had 2 long rectangular tables for the guests, we decided to use floral garlands instead of traditional arrangements. The guests were delighted, for many it was very unusual! Also the tables were decorated with lot of candles, which added more romantic atmosphere. The ceremony was held in very authentic old villa, where formerly lived the British writer Lawrence Darrell when he was spending vacation with his family in Corfu. After the ceremony, the guests went to the villa, where they were waited with drinks and snacks made from the local seafood. We pictured our wedding as not quite formal, we combined the traditions of Russia, Israel and USA in one holiday. We hoped that our wedding would be very fun, but it was even more fun – we danced all evening and all night. No one practically sat down. For us it was a success! WOW!! What wonderful photos! Feel a sense of taste and aesthetics in the photographer, bravo! This is the perfect work of the whole team!